Prices are too high. The prices for home party items are generally about DOUBLE what you’d pay for a similar quality item elsewhere. Don’t believe me? Comment below and I will point you towards a similar item for half the price. Pressure to buy. As much as your friend who is hosting will tell you that there is no pressure to buy anything, leaving one of these parties without buying something is VERY awkward. Believe me, I’ve tried… and I felt like the biggest jerk in the room. Business with friends. If there is a problem with your purchase, are you going to feel comfortable asking your friend for a refund? I’m not saying that business with friends is always bad. You should just be cautious, especially when you’re concerned about your finances. Pressure to sell. Most of these parties include a presentation about how great it is to sell with the particular company. While I’m all for trying to earn extra money, there is generally a significant cost associated with getting started. It’s not a decision that should be taken lightly. False scarcity. Most of these companies create an artificial scarcity of their products to make you feel like you need to buy right now. Limited time! Limited quantities! Holiday series! These tactics are a way to get you to buy at the party instead of going home to sleep on it (where you’ll likely decide you don’t really need the item, especially not at that price). Inconvenient shopping. I enjoy a good party as much as anyone, but if I’m trying to shop, there are a lot more convenient ways to do it. It’s a lot quicker to just go to a well-stocked store to pick something up or order from a web site for quick delivery. Pressure to host. If you attend these parties, you will get asked to host your own party. Earning free products by hosting a party can be attractive, but you will spend money hosting the party (food, drinks, etc). And let’s be honest… you’re probably going to end up spending money on more products, too. One party leads to many parties. If you attend one friend’s jewelry party, how can you say no to another friend’s cleaning product party? It is not easy to say no to friends, but you’re less likely to hurt someone’s feelings badly if you are fair with your RSVP’s and say no to all of them. You don’t need it! 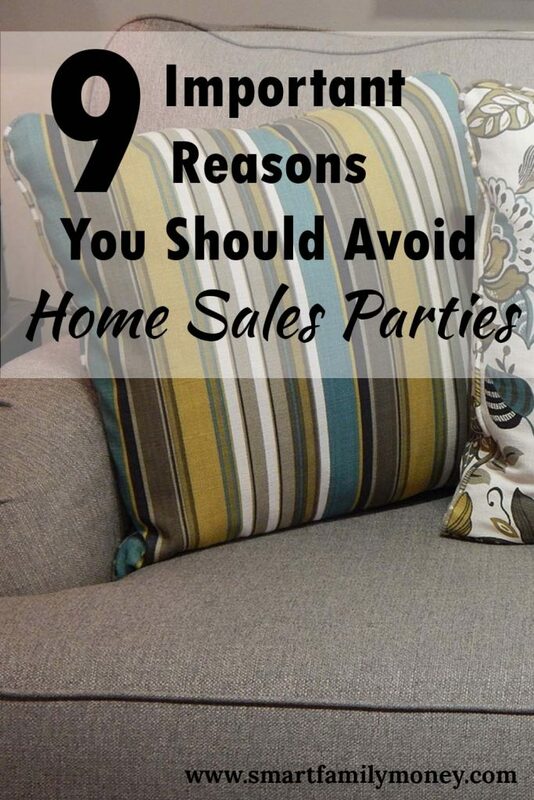 The biggest reason you shouldn’t attend home sales parties is because you don’t need any of the products. All of the items for sale are luxuries. Of course it’s fine to have some luxury in your life, as long as it stays within your budget, but there are more economical ways to do it! 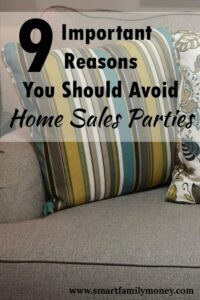 I’ve been saying no to all the home sales parties I’m invited to for many years now, and it is still not easy. Having the “just say no” rule for myself makes it easy to click the “Can’t Go” button on the Facebook invitation for my friend’s cousin’s neighbor’s party, but it’s not as easy to say no to close friends. Thankfully, my good friends understand, and they still invite me over for wine and cheese on evenings without sales. Do you agree with my reasons to skip MLM parties? Comment below and tell me what you think! I agree! The pressure is always there to attend, but I have been “just saying no!” for awhile now. Good for you! I’m sure your budget is better off! So many people these days are choosing to stay at home with their children and in turn look for something they can “do” from home. MLM’s are a way to make a little extra side cash as well as get out there and meet new people. Most (not all) of these people choose one they can get behind for whatever reason – they like the clothes, the candles are the best they’ve ever bought, the skincare products actually work, the jewelry is pretty and affordable. What most would really like, however, is support from their family and friends. Owning your own business is not easy. Putting yourself out there, knowing other people are judging you for various reasons, is not easy. When someone has a “party” for their business and says, “Please come! You don’t have to buy anything!” THEY MEAN IT! They really just want some support. Yes, of course, the goal is to make some sales, but there are more important things in life than money. I was like you. I didn’t like parties and always said no. And then I decided to sell for one of these companies myself. I chose to do one where I don’t have to have parties, but I now have a very different understanding of how all of this stuff works. I understand the need for support. I understand how important it is for the psyche. From a budget standpoint, maybe that candle does cost more than the one you can get at Target, but will it last as long? And do you personally know the CEO at Target that will be getting your money? Same with those leggings. Yeah, I can probably get some for half the price somewhere else, but if I buy them from my cousin who sells them, I know that I am helping to support her business and her family. From a money standpoint, unless you actually NEED those leggings, yes, your budget is better off not buying them. However, last I checked, kindness and support of a friend was free. Thanks for stopping by, Michelle. Yes, kindness and support are free! I’m just trying to help people reach their own financial goals.